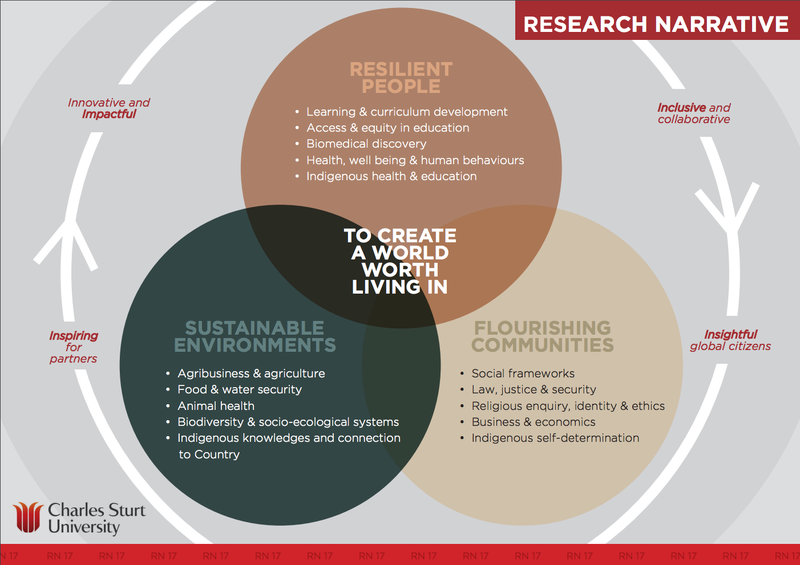 "to create a world worth living in"
Charles Sturt University is operating in a paradigm of research excellence and partnership. We will provide meaningful outcomes for industry, government, business, and communities. We seek to make an impact on our worlds – regional, national and global – and contribute to their economic, social and environmental sustainability and well-being. Three interdisciplinary research spheres have been identified to encapsulate our research activity. This encapsulates research that contributes to the development of educated, healthy, resilient people. This encapsulates research that contributes to developing communities that will be thriving economically, with strong social frameworks, and where diversity and harmony reside. This encapsulates research that contributes to the development of sustainable solutions in agriculture and water resources while enhancing the biodiversity of our environments and strengthening ecosystems. The research spheres are interlocking to indicate the interdisciplinary nature of our research. There will be deliberate cross-fertilisation across the three spheres through collaboration, innovation and co-investment. The Research Narrative is aligned with the University 2017-2022 Strategy in delivering impactful, solution-driven research that reflects our existing areas of strength and tackles new challenges. The Research Narrative will have greater import for investment and recruitment at CSU. It will drive research investment decisions, research staff recruitment activities, and HDR recruitment and scholarship support.